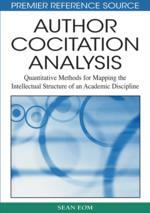 This is the capstone chapter that shows how the concepts, tools, and techniques discussed in each of the previous chapters can be applied in conducting author cocitation analysis using a real data in the DSS area. The step-by-step procedures are shown in detail from the preparation of data file in Excel format and importing the file to the SAS system for multivariate statistical analysis. This chapter also guides the readers through the process of analyzing the results of principal components analysis, cluster analysis, and multi-dimensional scaling. The chapter also shows how to apply different criteria to select the optimal number of factor solutions, cluster solutions, and evaluating the acceptability of multi-dimensional scaling outputs. This chapter reports part of the intellectual structure of the DSS field by means of an empirical assessment of the DSS literature over the period 1969 through 1989. Three multivariate data analysis tools (factor analysis, multidimensional scaling, and cluster analysis) are applied to an author cocitation frequency matrix derived from a large database file of comprehensive DSS literature over the same period. Four informal clusters of decision support systems (DSS) research subspecialties and a reference discipline were uncovered. Four of these represent DSS research subspecialties—foundations, model/data management, user-interface/individual differences, and group support systems. One other conceptual grouping defines a reference discipline of DS—organizational science. The primary data for this study were gathered from a total of 632 citing articles in the DSS area over the past 20 years (1969-1989). The details of the nature of these citing articles can be found in (Eom, 1995; Eom & Farris, 1996). These citing articles consist of two categories—specific DSS application articles based on the same definition and collection criteria of Eom and Lee (1990) and non-application articles.